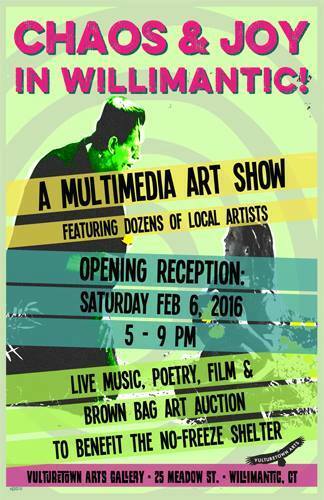 The second annual "Chaos & Joy in Willimantic" multimedia art show opens Saturday, February 6th. 2nd annual Chaos and Joy in Willimantic! A multimedia art show featuring dozens of local artists. Performances by Cerise Montclair, Greyglitch, Izikhotane, The Meteorological Society, and more. Film, refreshments and a brown-paper bag auction to benefit the No Freeze Shelter. This is a FREE event but please bring a non-perishable food item to be donated to the Covenant Soup Kitchen.